Guy Fieri's new Las Vegas restaurant called 'Guy Fieri's Vegas Kitchen & Bar' is scheduled to open this Thursday, and to help celebrate, he is teaming up with Yelp to do a "Meet & Eat." Twenty Yelpers will get to try his "flavor-tastic" food and Guy will be posing with photos with Yelpers after their meals. To qualify, you need to have a real photo and full name on your Yelp profile and have recent reviews. 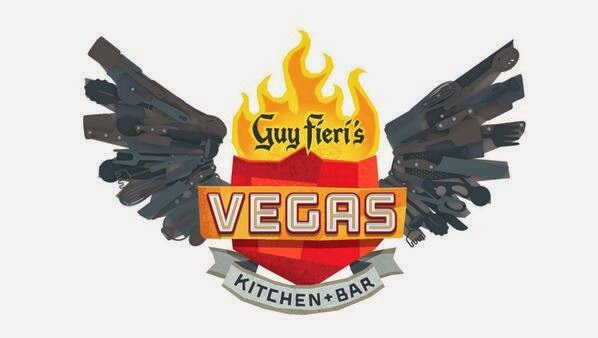 Guy is inviting 20 lucky Yelpers in to be the first to experience the 'flavor-tastic' food of his new restaurant, Guy Fieri's Vegas Kitchen & Bar! But we're not stopping with food and drink. Guy will be hanging out in the restaurant and will be posing for photos with Yelpers after their meals. Win! * Comment below! Have you ever tried to recreate a recipe you saw on DDD? ** Confirmations will be sent out on 4/15 at 8pm. ** This invite is for you only. NO GUESTS. Sounds like this could be a way to get some positive reviews on Yelp from people with established accounts. Guy fans, free food and drinks, and getting to meet Guy Fieri could equal some 5-star reviews on Yelp. There is already one 5-star review before the restaurant has opened (supposedly from someone that attended an event with free samples of the food, and has reviewed restaurants such as Arby's, McDonalds, Starbucks, Little Caesars, and PF Changs). The full menu has not been revealed yet, but Guy has said, "It’s going to have a mix from Asian to Mexican to Italian to American. We’re doing everything from a pulled pork taco to a slider to General Tso lollipop chicken wings. So it’s eclectic food in a high energy environment. And of course specialties like really cold beer and a shot bar with a Bloody Mary brunch." He also said almost all of the items will be original and not at his other restaurants. When he does release the menu, expect more ridiculous descriptions for each "flavor-tastic" menu item. Love the fact that there is no suggestion that the selection will be random. Instead it is a casting call, where producers select the participants based on how they believe the cast members will respond. So tacky. I guess if your real photo isn't camera worthy you miss out, besides they fact that they are obviously pimping for reviews. I know some of his other restaurants did not get good reviews so they're trying to head that off I guess. Love Vegas, but this announcement is not in the least motivating. Really cold beer is a "specialty"? It's really cold! Like ice cold!! Although given the hodgepodge of menu items, it appears that they aren't interested in any other "specialties"
I can't wait to try the Slamma Jamma Slap-Yo-Mama Mexi-Cali Tuna Fries with Raging Gangsta Sauce and Fried Goatee Clipping Cracklins'! XXXTREME! Using that same bottled Tso's sauce on wings instead of a pork shank makes it a new recipe according to Mr. Guy Ferry.